This is set incliudes a pair of Handmade high quality sterling silver earrings and a pendant. 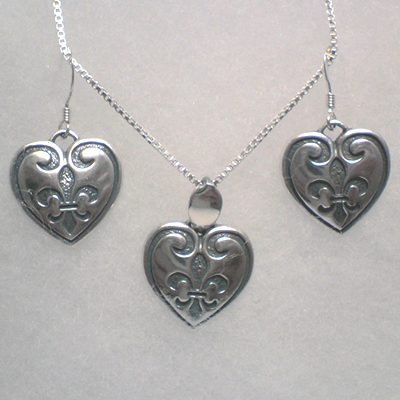 Features a nice heart with the Fleur-de-Lys emblem in the middle. Exclusively here directly from it's Designer Artist ! 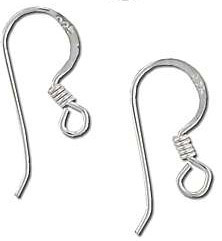 -french wires are for pierced ears stamped 925 sterling silver no extra cost. -lever backs are for pierced ears stamped 925 sterling silver, secure setting that clips in the back extra 3.00 per pair. -clip on are for non-pierced ears are surgical steel hypo-allergic extra 2.00 per pair. -post studs are for pierced ears stamped 925 sterling silver extra 2.00 per pair. **All our pendants include a free silver plated chain which you can upgrade to sterling bellow.